There has been a lot of hype surrounding Google Glass and I finally managed to get my hands on one of them at London Tech week. For those of you who don’t know, it’s essentially a wearable computer. You are supposed to be able to do all sorts of cool things with it: take pictures, ask google questions, send messages etc. My first reaction when I put it on? It’s very light. But the screen? I admit I wasn’t expecting a gigantic cinema screen, but I was surprised by how small it was. At first I was standing in front of the window so I couldn’t see properly. So I positioned myself away from the window and immediately noticed a difference. But still, it was too small, and I felt my eyes straining. I’d only had the Google Glass on for about a minute and already I couldn’t wait to take them off. I was told to tap the side of the frame to go through the menu and select options. The swiping action worked quite nicely and it was smooth. I was told to tap if I wanted to take a picture and I found this quite easy. But I couldn’t help thinking about privacy issues. At the moment, at least with smartphones you have people screaming excitedly: “Selfie!! 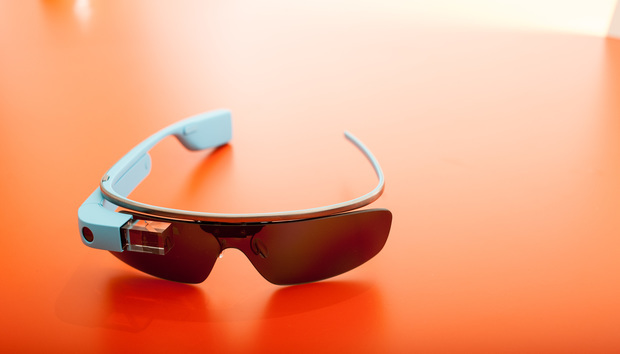 !” giving you a bit of warning, but with Google Glass you could take a picture very subtly. I tried one last thing quickly before I took them off. I went into Google and asked it a question to see how accurately and fast it responded. This was surprisingly good. It correctly registered my question and brought up a range of results. My final thoughts? Very light to wear, but the screen is too small and my straining eyes did not make for an enjoyable experience. I was told this is just a prototype so there is room for improvement. But I will be gladly sticking with my smartphone for now.